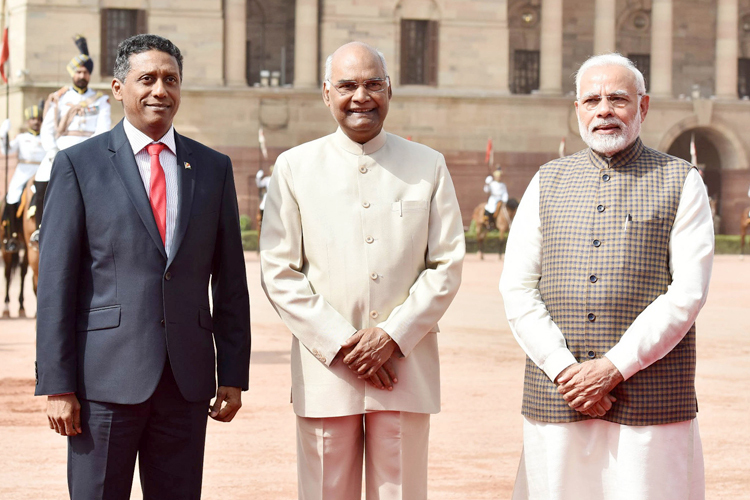 The President of the Republic of Seychelles, Danny Antoine Rollen Faure with the President, Ram Nath Kovind and the Prime Minister, Narendra Modi, at the Ceremonial Reception, at Rashtrapati Bhawan, in New Delhi on June 25, 2018. 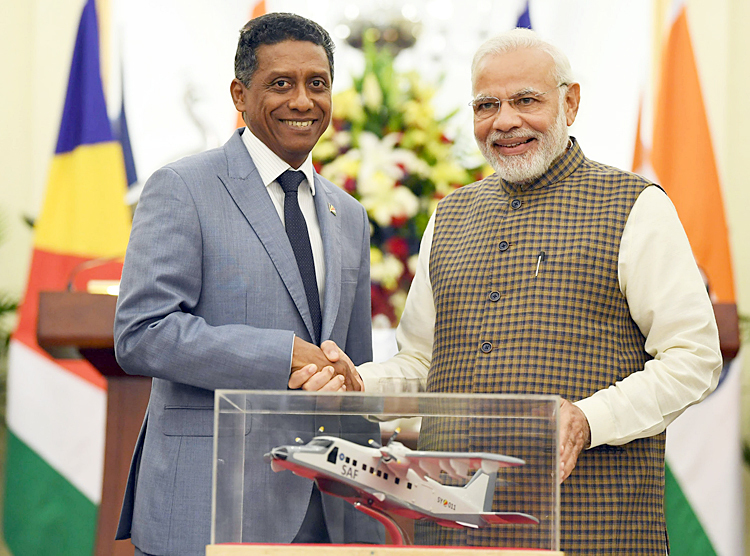 Seychelles President Danny Faure arrived at Ahmedabad on evening of June 22 for a six-day visit to India. His visit included visiting Gujarat, New Delhi, Goa and Uttrakhand. His official engagements included meeting President Ram Nath Kovind, delegation level talks with Prime Minister Narendra Modi, calls by the Vice President and the EAM, and addressing the India-Seychelles Business Forum. The delegation level talks between Modi and Faure covered wide-ranging bilateral cooperation including in the fields of defence and security and development partnership. Faure's visit came after the Seychelles Government had announced they would not present the $500-million Assumption Island India-Seychelles agreement for ratification to their Parliament that would have given India strategic advantage in the Indian Ocean Region (IOR)., dealing a blow to India's maritime aspirations. Seychelles took this decision in face of heavy political opposition. In fact, on June 4, 2018, Faure clearly stated in a press conference that Seychelles would develop military facilities on Assumption Island on its own, and the project with India "will not move forward". between Foreign Service Institute (India) and Department of Foreign Affairs (Seychelles). 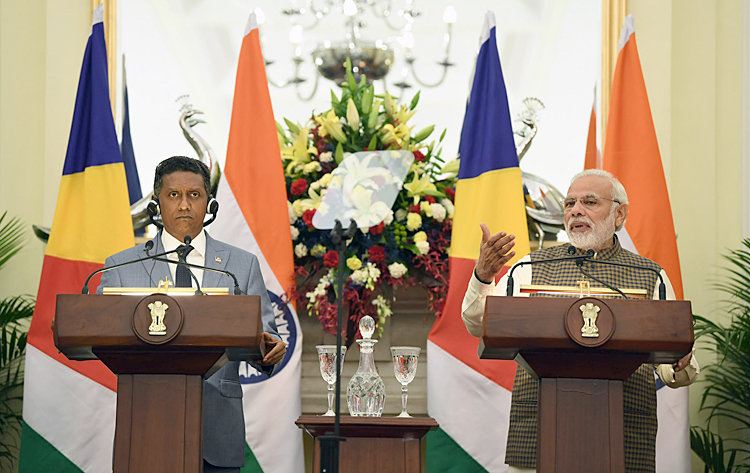 During Faure's visit India extended a $100 million line of credit to Seychelles. India also gifted a second Dornier aircraft to Seychelles to help Seychelles monitor its 1.3 million sq. km exclusive economic zone (EEZ), estimated to be twice the size of Madagascar's EEZ. The Dornier was scheduled to arrive in Seychelles on June 29, in time to participate in their national day celebrations on June 29. The Prime Minister, Narendra Modi and the President of the Republic of Seychelles, Danny Antoine Rollen Faure at the Joint Press Statements, at Hyderabad House, in New Delhi on June 25, 2018. Addressing the media jointly with President Faure after the delegation level talks, PM Modi said, "India and Seychelles are committed to maintaining peace and stability in the Indian Ocean Region. We have agreed to work on the Assumption Island project based on each other's rights....India and Seychelles are major strategic partners. We respect the core values of a democracy and share the geo-strategic vision to maintain the peace, security and stability in the Indian Ocean." Modi added that India was committed to working with Seychelles to help the 115-island archipelago combat traditional and non-traditional threats from drug trafficking to piracy. In his remarks, Faure concurred, saying, "Assumption Island project was discussed, we are equally engaged and will work together bearing each other's interests." Before his India visit, Faure had stated he would not discuss the Assumption Island project in India. However, the issue apparently was brought up by India during their formal discussions. The agreement had come under popular criticism in Seychelles and the opposition party has refused to support the government on this. Almost 50 per cent of Seychelles' military assets have reportedly been supplied by India, besides India providing training to 70 per cent of its military personnel. Overall, India has gifted the Seychelles Coast Guard a fast track vessel, a Dornier aircraft, and two helicopters. The eighth edition of Lamitye bilateral military exercise between Indian Army and Seychelles People's Defence Force was held at Mahe Island in Seychelles in February 2018. "Lamitye" in Creole (local dialect of Seychelles) means friendship. Almost 90 per cent of Seychelles population lives in Mahe. Bilateral Lamitye exercises are conducted with the aim of enhancing military cooperation and interoperability between defence forces of the two countries. Lamitye 2018 was aimed at countering insurgency, terrorism and piracy. 45 all ranks of Indian Army participated in Lamiyte 2018; comprising four officers, five JCOs and 36 Other Ranks. The Prime Minister, Narendra Modi handing over replica of Dornier Aircraft to the President of the Republic of Seychelles, Danny Antoine Rollen Faure, at Hyderabad House, in New Delhi on June 25, 2018. It may be recalled that during the visit by PM Modi to Seychelles in March 2015, Assumption Island in Seychelles was reported as becoming India's first overseas base. In fact, Assumption Island project in Seychelles and the facility in Agalega Islands in Mauritius were seen as key elements of a seeming counter narrative India was building to stave off Chinese moves of raising its profile in the IOR. 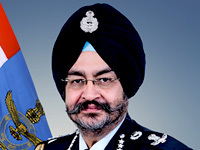 A military base would imply the presence of Indian Military personnel and assets on Assumption Island, in consultation and agreement by the host government - Seychelles. Whether India can still aim for that as originally planned or will it now boil down to building radar facilities on the island in conjunction Seychelles, without necessarily stationing its personnel there is what remains ambiguous. 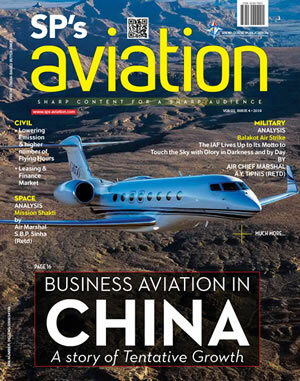 China for sure will work to negate both or at best ensure only the latter eventually materializes.